What to Consider Before Installing a ComfortBrush? Finding the best place to install a FutureCow ComfortBrush at your facility is vital before you make your purchase. Here is a quick guide to choosing the best spot. We recommend a minimum of 8 to 10 feet of clearance on both sides of the brush. Be aware of structures like gates or half walls that could become obstructions. Avoid areas in or around entrance and exit lanes, as well as dead-end spaces when selecting your cow brush placement. FutureCow’s ComfortBrush is available in 110v/220v and a 3-Phase 480v option. If you plan to run a new electrical drop, confirm what voltage you need before wiring the installation location. If electricity is already available, make sure it is enough to power the type of brush you choose. 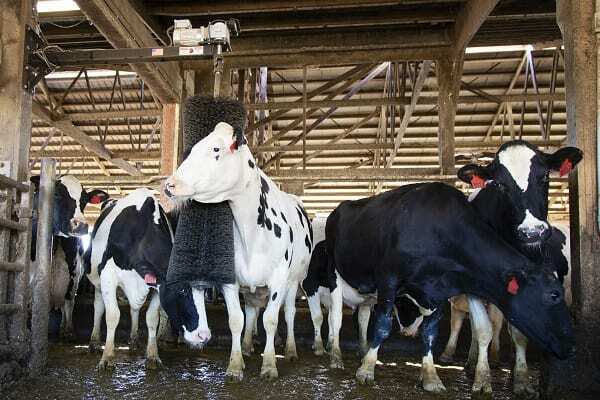 ComfortBrush can be installed in any type of barn facilities. Any area that usually offers the minimum required available space would be ideal, letting the brush move without any obstruction and avoiding traffic jams in cow flow. The most common placement is on a crossover beam. If you do not have a usable crossover, an outside alley post farthest from the entrance is another option. Cow brush placement on an outside alley post will direct cows away from the entrance and down the alley. This eliminates traffic jams as they stop to use the brush. It is important to place the brush in an area where cows have an escape route. This gives less dominant cows a way to avoid being disturbed by more dominant ones. If you choose to install your brush outside and do not have a solid wall, a strong mounting post can be used. A 6-by-6-inch treated wood post or a 4-by-4-inch steel tube is the minimum size recommended to mount your brush. You can retrofit an existing post to mount the brush if it is sturdy and properly anchored into the ground. Keep in mind that if the upright is not wide enough, you may need to fabricate a mounting adapter. Make sure your post is strong enough, tall enough and is firmly secured. Bury it deep in the ground with a concrete base as reinforcement. The underground post serves as an anchor, so the further down you sink the post, the more stable it will be. At a minimum, the post should be sunk into the ground 4 feet deep and 12 inches in diameter with concrete reinforcement. We suggest no more than 100 animals per brush. All of our cow brushes can be used with multiple animals at the same time. If you add multiple brushes in one pen, we recommend placing one brush at the first crossover alley and one on the last crossover alley. Installing brushes on opposite ends helps lessen overcrowding by encouraging cows to gather on both ends of the pen.